Gentex Corp. supplies the new Kia Sportage with a special mirror that is linked to a camera on the tailgate that provides the driver with a view directly behind the vehicle while backing up. When the vehicle is shifted into reverse, a display appears automatically through the auto-dimming mirror's reflective surface, enabling the driver to check the rear view and the blind spot below the rear window. The display disappears when the vehicle is shifted into any other gear. Hyundai Wia Corp. supplies a number of key elements to the compact SUV, such as the sideshafts and power takeoff units for the four-wheel-drive version of the Sportage and the manual transaxle. INA, which is part of the Schaeffler Group, provides the anti-friction bearings, strut bearings and valve lash adjustment elements, while another Schaeffler Group company, LuK GmbH, supplies the Sportage with a dual mass flywheel, clutch discs and a self-adjusting clutch. Robert Bosch GmbH supplies the SUV's engine control unit and injection valves for direct injection, as well as the throttle valve. Kia manufactures the Sportage at locations in eastern Europe and Asia. Starting in 2012 all production will be on a unified platform and model code. 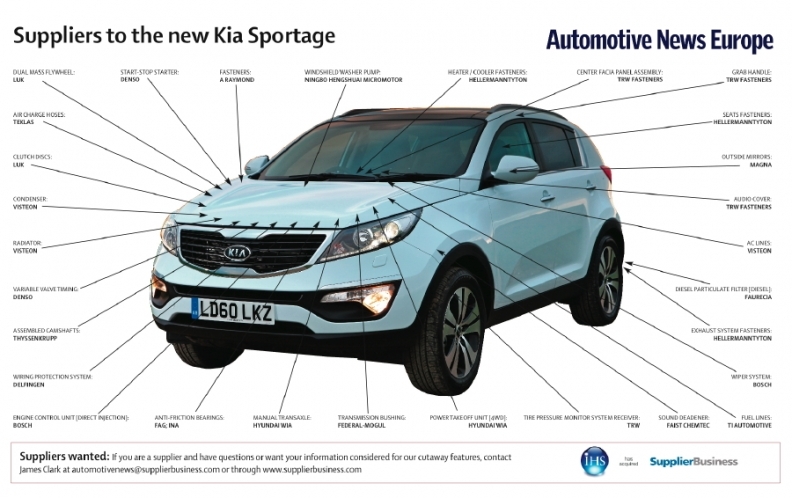 In Europe, the Sportage is built at Kia's plants in Zilina, Slovakia and Kaliningrad, Russia. Peak production is forecast by IHS Automotive to be 88,000 in 2013 and 2014, while combined global production volumes will continue to rise through to 2017 thanks to increasing production at the company's plant in Yancheng, China.